Support the Discord Gaming Network today! Thanks to every each one of our 52,000+ members, we are proud to say we host the largest GTA Discord community, housing partners such as Silentc0re, Broughy1322, and the /r/GTAOnline and /r/HeistTeams subreddits. 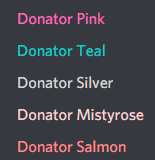 While the Discord server originally had its focus set on heists, we decided it would be better for us to incorporate more than just heists and move on to be about the entirety of GTA Online instead. Thanks to that, the support of our partners and last, but not least, the support of our members, we were able to grow almost exponentially within months. We've recently decided to branch out and try our formula with new servers and so we opened out Red Dead Redemption 2 server. Since, it's seen a steady growth, and we're happy to see it's on a good way to become the largest Discord community once more, thanks to partners such as Silentc0re and our wonderful community. How the future looks, we genuinely cannot tell, but we certainly do plan on improving what we can improve and providing you the best possible experience on our server. And we hope that we can do that with you by our side. As much as we'd like to say that our server doesn't cost us anything, that's simply not true. The development of our bots and other expenses such as advertising for example grow linearly with the growth of our community to the point where it's becoming too much for us to keep things to the high standards we'd like them to be without any help, so we're turning to our community in order to be able to maintain them. The money will mainly be going towards the development and upkeep of our bots and servers, as well as other expenses. Once there's enough money, we will then start putting the money towards our server in a more directly manner, with giveaways, for example. The final step would then be to pay our staff for the many hours they dedicate to community to keep it running smoothly. We are always hugely grateful for our patrons so as our thank you we have outlined rewards to give back for your generosity. Furthermore, your generosity will also benefit the community as a whole, since we will be able to host giveaways, game servers and so on, once all of our running costs are covered. Without you, none of this would be possible. We love our community and are striving towards making it the best it could ever be. Whether it be via talking to you, helping you, holding events or giveaways, we want to strive for more. It's a dream, a passion we want to keep alive. So we hope that we can do so with your support. Personal role with custom colors and your own name. Suggest an emote for us to implement in the server! For streamers: Have your stream automatically posted once you go live in our #media channel! All rewards are shared across our servers. Note that we may reject the sponsorship if we decide that it is not in line with our server's goals/morals/rules. Our bot and server development is paid for! As you might imagine, development isn't exactly what you'd call cheap. But with this amount of money, we will be able to securely sustain our bot and server development.